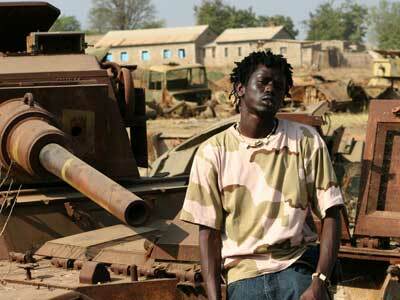 You are here: Home / BC Christian News / April 2000 / What is life like in war-torn Sudan? What is life like in war-torn Sudan? There are some things of which we cannot conceive, that our brains can’t fathom unless we see it first hand. Many people can imagine what Sudan’s living conditions are, but they would never fully understand. Those lucky enough to live in the Western world cannot conceive of what life is like in the country that is in the middle of a ‘holy war’ that has pitted Muslims and Christians against each other since 1958. That’s the reason Rev. of St. Matthew’s Anglican Church in Abbotsford went to Sudan as a part of a fact-finding mission — to see, feel, taste, touch, smell and hear how the people of Sudan are suffering. And he has come back a changed man. Walters, along with parishioner Enk Hoogenraad, left for Sudan January 10 and arrived home February 4. They spent three weeks in northern Sudan, which is occupied for the most part by Muslims. They went in conjunction with the Mennonite Central Committee. While there, the two Canadians toured refugee camps and prisons — places which thousands of Christians call home. The Christians, who live in the poor region of southern Sudan, are being persecuted by the Muslims because they cannot afford to protect themselves. Although organizations such as the Sudan People’s Liberation Army, which fights Muslim groups, do exist, they are still no match against northern resources. According to Walters, one of the men’s prisons had five latrine holes and two water taps for 1,000 men. Twenty percent of those men had bedding, and all of them slept outdoors. “It’s the worst squalor I’ve ever seen in my life,” he said. The women’s prison was only marginally better, having a tin roof over 50 percent of the women. Along with 780 women, there were nearly 200 babies under the age of three, most nursing. “There was extraordinary poverty, but phenomenal spirit. The people’s spirit was amazing,” Walters said. Many people he spoke with told him how glad they were that he was there, seeing what the world was choosing not to see. Two million people have died in the war, and four million people are fleeing the country as refugees. While the United States has imposed sanctions against trade with the northern part of Sudan, Canada has yet to take a stand. Canada’s Lloyd Axworthy, minister of foreign affairs, sent assistant John Harker to Sudan to investigate the situation and decide whether the Canadian government should become involved. What Harker investigated, as did Walters while he was there on his fact-finding mission, was the involvement of the Calgary-based oil company, Talisman Energy Inc., which is working out of southern Sudan. Harker found that oil revenues were going to the Muslims, who would then buy weapons to kill more people in the south. He wrote that in his report to Axworthy. Nothing has been done to this date. Walters said Canada should do the right thing and put a stop to Talisman’s involvement. “When I talked to people over there, they all said, ‘Take Talisman out.’ It was very emphatic,” he said. Over and over, he heard their frustrations, but could offer no explanation or words of encouragement. “There’s nothing I could have said that could have been of some help, other than ‘I will try to be your voice when I get back,'” Walters said. And that’s what he attempted to do during a forum called Close the Gap, Between Rich and Poor when he returned. Along with comparing prisons in Sudan and Canada, Walters shared what he saw, heard and felt in Sudan to anyone interested in hearing and understanding the situation just a bit better.